Pyrometallurgical chlorination process has been employed for the recovery of elements from indium phosphide, InP, one of the important III–V semiconductor materials. It was found that both indium and phosphorous were converted to volatile species, indium chloride and phosphine, PH3, by thermal treatment of InP powder in the presence of ammonium chloride. However, the recovery as volatile compounds reached ∼60% at reaction temperature of 800°C. Based on these results we have employed the thermal treatment of the mixture of InP and iron powders. 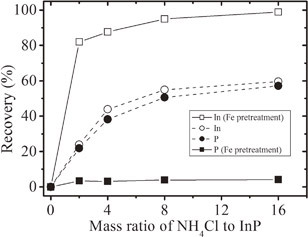 Phosphorous could be successfully converted to non-toxic iron phosphide, Fe3P. The consequent chlorination reaction resulted in the indium recovery of ∼100% in volatile form. The influence of reaction conditions, such as reaction temperature and composition of ammonium chloride, was examined.